Dr. Paul S Thoppil did his under graduation at Govt. Thrissur medical college, Thrissur, India followed by MD medicine at Govt. Stanley medical college, Chennai, India and DM Cardiology at KMC, Manipal, India. He did his advanced Electrophysiology fellowship at CARE hospital Hyderabad and CRT training at tolochenaz, Switzerland and Nanjing China. Dr. Paul has presented papers in various international conferences and articles in national and international journals. Dr. Paul has an extensive experience of more than 15 years in Interventional Cardiology and Electrophysiology. His work involves various procedures including Coronary Intervention especially Primary angioplasty and stenting, Elective angioplasty and ICDs-implantations. 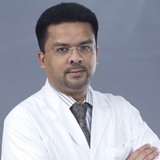 He was previously associated with Care Hospital, Hyderabad, Wockhardt Hospital and Manipal Hospital Bangalore.